Are you tired of space combat games that are nothing more than World War II Fighter Combat with a coat of paint? Do you feel that space combat has more to offer than the tired old Submarine Strike model? Would you like to see what real space combat looks like? Come make the paradigm shift to Attack Vector: Tactical, where space is harsh, the decisions are critical, and there's more to victory than having the biggest guns. 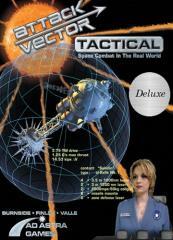 Attack Vector: Tactical is a fully realized Newtonian boardgame played on a hex map with displacement factored in, and the most realistic data available for spaceborn lasers, particle beams, kinetic weapons and nuclear warhead. 2 double sided geomorphic hex maps, 1.33" hexes on one side, 0.96" on the other. Playing time: 1.5 to 4 hours. This is a reprint and new edition of the Origins Award winning Attack Vector: Tactical, which brings unprecedented realism and three dimensional movement to spaceship combat, while still being playable as a boardgame. Revised layout; we're updating the layout of the physical rulebook to the standard set by SITS 2e and Squadron Strike, making them much more attractive and easy to read. Revised Ship Control Cards - these are the Deluxe Ship Control Cards that have been in testing off of the Ad Astra web site since 2006-2010, and have lots of minor revisions to improve clarity, and a restructured work flow that speeds up play - while also bringing some support to advanced players. All errata incorporated and a number of new examples and science behind the rules notes. Expanded setting book and revised scenarios. The Deluxe edition has a full color rulebook, making the examples and illustrations of the play aids much easier to understand.